You can’t brand a decade any more than you can brand a nation. 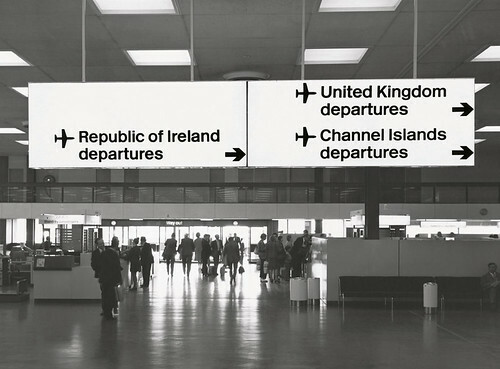 But for many, Margaret Calvert’s lettering left a big stamp on Britain in the 1960s. The public projects carried out by Jock Kinneir and Calvert, from the late 1950s, when they designed signs for Gatwick airport, through to 1965, when they completed the signing system for British Railways, bear the hand of South African-born Calvert, who drew the letterforms. Kinneir Calvert signed the motorways and roads with their Transport alphabet (see Eye no. 34 vol. 9). Rail Alphabet was drawn to be read in a slower, pedestrian context: signs for NHS hospitals and airports and rail stations. The original Rail Alphabet was produced purely for signing, and later adopted by DSB, the Danish railway corporation, where it was used until 1997. In Britain, Kinneir Calvert’s sign system began to disappear in the 1990s, as British Rail was privatised and split into smaller companies, each with its own logo and type. Station signs, the responsibility of Railtrack (the group in charge of the infrastructure), were eventually replaced by The Foundry’s custom typeface Brunel. 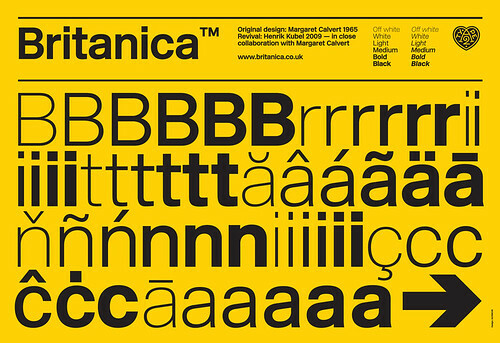 Type sample from the new company A2 Type, 2009, demonstrating the six weights of New Rail Alphabet (originally named Britanica), designed with corresponding italics, non-aligning numbers and a full set of Eastern European characters. 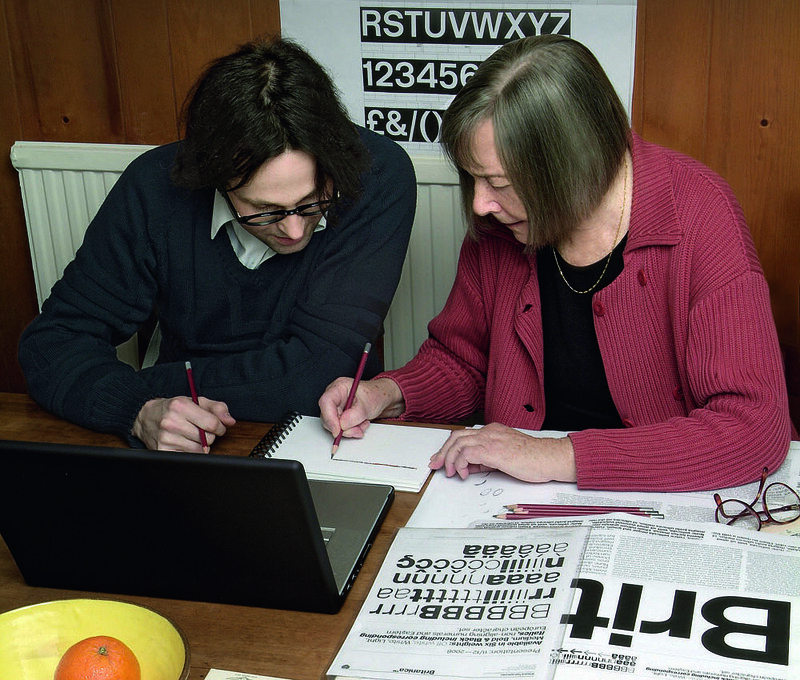 Top: A2’s Henrik Kubel and Margaret Calvert work on New Rail Alphabet at the table in Calvert’s home in north London. Photograph: Anthony Oliver, February 2009. In 2005, A2’s Henrik Kubel and Scott Williams approached Calvert with the idea of digitising Rail Alphabet for a touring British art project. Calvert, who had taught the Danish-born Kubel at the Royal College of Art in the 1990s, agreed. Kubel traced the original letterforms and produced a complete typeface in one weight. He and Williams never got to use it for that project, but subsequently employed it in their catalogue Jane and Louise Wilson for the QUAD exhibition in 2008. 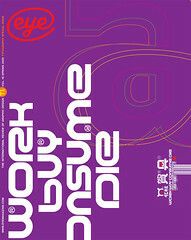 Turning a signing alphabet into a commercial typeface for text was a gargantuan task. Kubel resumed work, drawing and reshaping the new typeface, plus italics, in six weights: off white, white, light, medium, bold and black. The project had a personal dimension, too. Kubel had been familiar with Calvert’s letters since childhood, because his father worked for the DSB. Kinneir Calvert’s original sketches and materials had been consigned to a skip when the company closed, so all Kubel had to work from were printed copies of the British Airports specifications for sign-makers. Each poster showed one of two sets of lettering: light on dark (for warning signs such as ‘Do not cross’), and dark on light. Kubel scanned the originals, traced the characters and started from there. Internally illuminated black-on-yellow direction sign at Heathrow airport showing application of British Rail signing system, early 1970s. This was also installed in Sydney and Melbourne. ‘You do different things when you do text faces and signing faces,’ says Kubel. He points to small changes he has made in the original alphabet’s capitals (to stop them ‘spotting out’ in text), and x-height. ‘In the 1970s, having a high x-height was actually a fashionable thing, and we don’t want any fashion associated with this!’ says Calvert. A solution came from Calvert’s own body of work: her slab serif typeface Calvert, released by Monotype in three weights in 1980. Kubel observes that this is ‘essentially Brit Rail with slabs on – they come from the same origin, really’, referring to Calvert’s letters for the Tyne & Wear Metro signs, on which her typeface is based. ‘Now it is literally Calvert without serifs!’ she says. One of Margaret Calvert’s drawings for the italic version of New Rail Alphabet, initialled by Calvert and Kubel. Asked how her letters differ from rival systems, Calvert recalls the time she would drive all over Europe to see everyone else’s signs: ‘I was obsessive about looking at road signs … it sits with you for the rest of your life. We always thought the Swiss and Germans were better – there was an inferiority complex in this country.